While it is known that spermatogonial stem cells (SSCs) initiate the production of male germ cells, the mechanisms of SSC self-renewal, proliferation, and differentiation remain poorly understood. We have previously identified Strawberry Notch 1 (SBNO1), a vertebrate strawberry notch family protein, in the proteome profile for mouse SSC maturation and differentiation, revealing SBNO1 is associated with neonatal testicular development. To explore further the location and function of SBNO1 in the testes, we performed Sbno1 gene knockdown in mice to study the effects of SBNO1 on neonatal testicular and SSC development. Our results revealed that SBNO1 is required for neonatal testicular and SSC development in mice. Particularly, in vitro Sbno1 gene knockdown with morpholino oligonucleotides caused a reduction of SSCs and inactivation of the noncanonical Wnt pathway, through Jun N-terminal kinases. Our study suggests SBNO1 maintains SSCs by promoting the noncanonical Wnt pathway. Spermatogenesis originates from a self-renewing population of spermatogonia, known as spermatogonial stem cells (SSCs)., While SSCs only make up 0.02%–0.03% of the total germ cells in the testes, they can either undergo a self-renewal division or produce differentiating cells that will go through meiosis and eventually produce haploid gametes. Till date, the exact identity of SSCs has been uncertain; they are thought to be contained within a small population of cells known as undifferentiated spermatogonia. Spermatogonia reside on the basement membrane and move toward the lumen as the cells differentiate. In mice, undifferentiated spermatogonia are subdivided into spermatogonial types as follows: A single (As: isolated single cells), A paired (Apr: chains of two cells), and A aligned (Aal: chains of 4, 8, or 16 cells), on the basis of their shape. The wingless-related murine mammary tumor virus (MMTV) integration site genes (Wnt) are a family of secreted signaling glycoproteins involved in regulating a variety of developmental processes, including cell fate determination and differentiation,, and reproductive tracts of male and female mice., The Wnt pathway induces signal transduction through two known pathways: the canonical Wnt/β-catenin pathway and the noncanonical polarity pathway. Previous studies have suggested a possible role of the Wnt pathway in SSC regulation. For example, wingless-type MMTV integration site family member 5A (WNT5A) supports SSC survival by suppressing apoptosis, while WNT3A and WNT10B promote proliferation of the mouse SSC line, C18-4. Strawberry Notch 1 (Sbno1) is a novel chromatin factor of the helicase superfamily 2. Studies in zebrafish have shown that Sbno1 is highly expressed in distinct regions within the nervous system of the pharyngula-stage embryos. Moreover, injecting morpholinos against Sbno1 in zebrafish embryos caused abnormal brain morphology, delayed neural gene expression, and altered brain development in zebrafish. In mice, Sbno1 knockout embryos are lethal at the preimplantation stage without forming a blastocoel. Previous studies have also suggested that SBNO1 positively regulates transcription of its targets to activate the Notch (Delta) and Wnt (wingless) signaling pathways., In our previous work, we successfully identified SBNO1 in the proteome profile for neonatal mouse testes, and further bioinformatics analysis revealed that SBNO1 was associated with testicular development. In this study, utilizing cultured mouse neonatal testes and SSCs, we show that SBNO1 regulates SSC proliferation by the Wnt pathway. Pregnant mice from Institute of Cancer Research were maintained in a controlled environment under a 12/12 h light/dark cycle at 20°C–22°C and 50%–70% humidity, with food and water available ad libitum. All experiments on mice were approved by the Animal Ethics Committee of Nanjing Medical University, Nanjing, China. Mouse testis tissues of 3.5-day, 5.5-day, 7.5-day and explants were fixed in 4% (w/v) paraformaldehyde (Sigma-Aldrich, St. Louis, MO, USA). The tissues were then paraffin-embedded and sectioned into 5-μm thick sections. For immunofluorescence, sections were deparaffinized and rehydrated in a graded ethanol series. Antigen retrieval was performed in 10 mmol l-1 sodium citrate buffer (pH 6.0) for 15 min. After antigen retrieval, the sections were blocked with 5% bovine serum albumin (BSA, w/v; Sunshine, Nanjing, China) and incubated overnight at 4°C with primary antibodies [Supplementary Table 1 [Additional file 1]]. 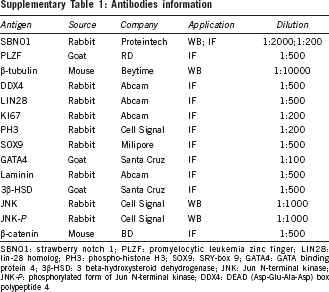 The nonimmune IgG antibodies were used for the negative controls [Supplementary Figure 1 [Additional file 2]]). After washing with phosphate-buffered saline (PBS) and Tween, the sections were incubated with Alexa-Fluor secondary antibodies (Thermo Scientific, Waltham, MA, USA), and images were captured under a confocal laser microscope (Zeiss LSM710, Carl Zeiss, Oberkochen, Germany). For immunofluorescence of SSCs, we cultured SSCs in a Millicell EZ slide (Merck Millipore Corporation, Darmstadt, Germany). Cells were fixed in 4% paraformaldehyde, blocked with 5% BSA and incubated overnight at 4°C with primary antibodies [Supplementary Table 1]. After washing with PBS, samples were incubated with Alexa-Fluor secondary antibody, and the cell nuclei were stained with 5 μg ml-1 4',6-diamidino-2-phenylindole (DAPI; Beytime Institute of Biotechnology, Haimen, China) for 5 min. All samples were observed in a confocal laser microscope. The western blot analysis was performed as previously described with minor modifications. Briefly, testicular lysates were separated by electrophoresis, then transferred to polyvinylidene difluoride (PVDF) membranes (Bio-Rad, Hercules, CA, USA). The membranes were then blocked in 5% nonfat milk and incubated overnight with the indicated primary antibodies [Supplementary Table 1], washed, and incubated at room temperature for 1 h with horseradish peroxidase (HRP)-conjugated secondary antibodies (Thermo Scientific). The protein signals were then visualized by SuperSignal West Femto Chemiluminescent Substrate (Thermo Scientific). For neonatal testicular culture, testes from 3.5-day mice were decapsulated and gently cut into several 1–3 mm diameter pieces. Testicular explants were cultured as previously reported. Briefly, 1.5% (w/v) agarose gel stands (10 mm × 10 mm × 5 mm placed in 24-well plates) were prepared 1 day before the testicular culture and incubated with culture medium for more than 24 h. The amount of medium was adjusted, so it would come up to half to four-fifths of the height of the agarose gel. The medium was changed every 2 days. Then, 3–5 explants were placed at the medium/air interface of each stand and incubated at 34°C and 5% CO2. The culture media contained α-minimum essential medium (α-MEM), 10% knockout serum replacement (KSR), 1% nonessential amino acids solution (NEAA), 0.1% β-mercaptoethanol, and 1% penicillin-streptomycin solution. The explants were cultured for 4 days with either 20 μmol l−1 morpholino oligomer (Mo) or its negative control (Ctr). Experiments were repeated 3 times and 9 mice in all were used in this study. For each experiment, at least eight explants were pooled from the testes of 3 mice in each group. For SSC culture, long-term culture of mouse SSCs was established in accordance with a previous described protocol. Briefly, dissociated testicular cells were cultured overnight on a 0.2% (w/v) gelatin-coated tissue culture plate (2 × 105 cells per 3.8 cm2). The plates were washed twice with PBS before use. Floating cells were passaged to secondary plates. These cells were then passaged 2 or 3 times before they were transferred to medium containing mouse embryo fibroblasts. The cells were maintained at 37° C, 5% CO2. SSCs were cultured for 4 days, either with 10 μmol l−1 Mo or Ctr. Sbno1 translation-blocking vivo-Mo (oligo sequence: 5'-AAATCTTGCCCTGGTTCCACCATCG-3') and its control (oligo sequence: 5'-CCTCTTACCTCAGTTACAATTTATA-3') were purchased from Gene Tools (Philomath, OR, USA). Gene expression was quantified by using the SYBR Premix Ex Taq™ kit (TaKaRa, Dalian, China) in an ABI 7300 real-time PCR instrument (Applied Biosystems, Foster City, CA, USA). The standard curve method with 18S rRNA was used as the reference gene. 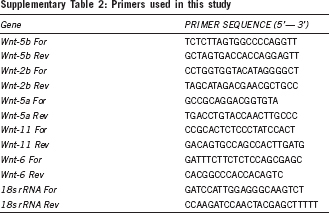 The primers used are listed in [Supplementary Table 2 [Additional file 3]]. Amplification was performed in 20 μl reaction volumes, according to the manufacturer's instructions. The quantitative results are presented as mean ± standard deviation (s.d.). The data were evaluated for statistical differences using Student's t-test by Graphpad Software (https://www.graphpad.com/) with *P < 0.05,**P < 0.01, and ***P < 0.001. We used immunostaining to analyze SBNO1 distribution in neonatal mice testes. As shown in [Figure 1]a, SBNO1 was restrictedly located in the seminiferous epithelium of 3.5-, 5.5- and 7.5-day testes [Figure 1]a. Moreover, we found that SBNO1 was completely co-located with SSCs marker, promyelocytic leukemia zinc finger (PLZF) in 5.5-day testes [Figure 1]b, as well as in cultured SSCs [Figure 1]c.
Figure 1: Expression and distribution of SBNO1 in neonatal testes and SSCs. 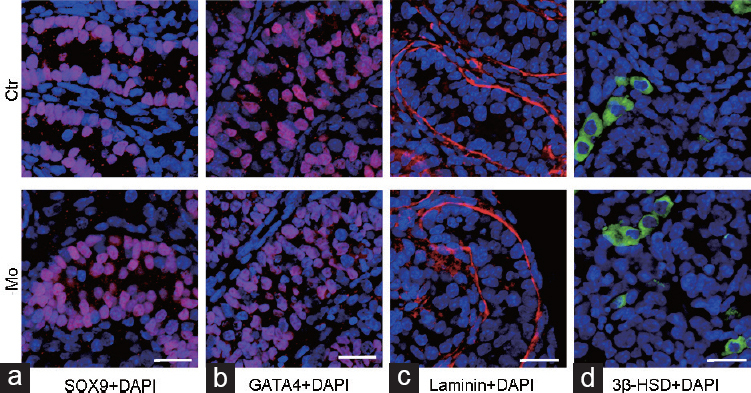 (a) Representative images of SBNO1 (red) immunostaining in 3.5-day, 5.5-day and 7.5-day mouse testes. (b) Co-immunostaining of SBNO1 (red) and PLZF (undifferentiated spermatogonia marker, green) in 5.5-day mouse testes. (c) Immunofluorescence of SBNO1 (red) and PLZF (green) in SSCs. Scale bars = 20 μm. SBNO1: Strawberry Notch 1; PLZF: promyelocytic leukemia zinc finger; DAPI: 4',6-diamidino-2-phenylindole; SSC: spermatogonial stem cell. We successfully reduced SBNO1 translation in vitro, which was confirmed by the western blot analysis [Figure 2]a, revealing about 55% suppression efficiency [Figure 2]b. We examined the cultured testicular explants incubated with morpholino for 4 days by immunostaining, and the results revealed a significant reduction of DEAD (Asp-Glu-Ala-Asp) box polypeptide 4 (DDX4)-labeled germ cells [Figure 2]c and [Figure 2]d and lin-28 homolog (LIN28)-labeled SSCs [Figure 2]e and [Figure 2]f. The proportion of reduction was about 52% [Figure 2]d and 43% [Figure 2]f, respectively. Furthermore, we observed an obvious reduction of marker of proliferation Ki-67 (Ki-67)- [Figure 3]a and [Figure 3]b and phospho-histone H3 (PH3)-labeled proliferative cells [Figure 3]c and [Figure 3]d in the Mo group. We verified apoptotic signals by using terminal deoxyribonucleotidyl transferase (TDT)-mediated dUTP-digoxigenin nick-end labeling (TUNEL), and the results showed no obvious changes in apoptotic signals between the Mo and Ctr groups [Figure 3]e and [Figure 3]f.
Figure 2: SBNO1 and germ cell development. 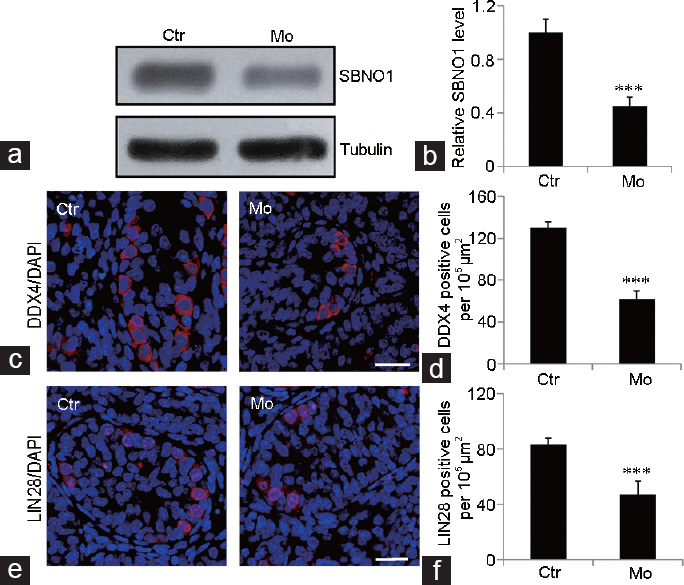 (a) Western blot analysis shows high knockdown efficiency of SBNO1 by morpholino. (b) Quantification of a. (c) Representative images of DDX4 (germ cell marker, red) immunostaining in Ctr and Mo testes. (d) Quantification of c. (e) Representative images of LIN28 (undifferentiated spermatogonia marker, red) immunostaining in Ctr and Mo testes. (f) Quantification of e. ***P < 0.001, Student's t-test, n = 3. Scale bars = 20 μm. Ctr: negative control; Mo: morpholino-treatment; SBNO1: Strawberry Notch 1; DDX4: DEAD (Asp-Glu-Ala-Asp) box polypeptide 4; LIN28: lin-28 homolog; DAPI: 4',6-diamidino-2-phenylindole. Figure 3: SBNO1 and germ cell proliferation. (a) Representative images of KI67 (proliferative cell marker, red) immunostaining in Ctr and Mo testes. (b) Quantification of a. (c) Representative images of PH3 (proliferative cell marker, red) immunostaining in Ctr and Mo testes. (d) Quantification of c. (e) Representative images showing the results of the TUNEL assay (red) in Ctr and Mo testes. (f) Quantification of e. **P < 0.01, Student's t-test, n = 3. Scale bars = 20 μm. Ctr: negative control; Mo: morpholino-treatment; KI67: marker of proliferation Ki-67; PH3: phospho-histone H3; TUNEL: terminal deoxyribonucleotidyl transferase (TDT)-mediated dUTP-digoxigenin nick-end labeling; DAPI: 4',6-diamidino-2-phenylindole. We revealed no significant changes in the distribution and quantity of SRY-box 9 (SOX9)-labeled Sertoli cells More Details and GATA binding protein 4 (GATA4)-labeled Sertoli cells in the Mo group [Figure 4]a and [Figure 4]b. To detect the integrity of seminiferous tubules after SBNO1 knockdown, we labeled the basal laminae of testes with laminin, which revealed seminiferous tubules were integral in the Mo group [Figure 4]c. Moreover, immunostaining of Leydig cells with 3 beta-hydroxysteroid dehydrogenase (3β-HSD) revealed that the number of Leydig cells remained unchanged between the two treatment groups [Figure 4]d.
Figure 4: SBNO1 knockdown and somatic cells and the integrity of the seminiferous tubules. Representative images of (a) SOX9 (Sertoli cell marker, red), (b) GATA4 (Sertoli cell marker, red), (c) laminin (basal laminae marker, red) and (d) 3β-HSD (Leydig cell marker, green) immunostaining in Ctr and Mo testes. Scale bars = 20 μm. Ctr: negative control; Mo: morpholino-treatment; SBNO1: Strawberry Notch 1; SOX9: SRY-box 9; GATA4: GATA binding protein 4; 3β-HSD: 3 beta-hydroxysteroid dehydrogenase; DAPI: 4',6-diamidino-2-phenylindole. We found a marked decrease in Wnt5b mRNA in the Mo group compared with the Ctr group [Figure 5]a; although we did not observe any significant variations in Wnt2b [Figure 5]b, Wnt5a [Figure 5]c, Wnt11 [Figure 5]d, and Wnt6 [Figure 5]e mRNA levels. In addition, western blot data also indicated an obvious reduction in the activated phosphorylated form of Jun N-terminal kinase (p-JNK) in the Mo group, while total JNK levels remained unchanged [Figure 5]f. Furthermore, immunostaining of β-catenin in Mo treated testes showed no variation compared with Ctr treated testes [Figure 5]g.
Figure 5: Effect of SBNO1 deficiency on the noncanonical Wnt pathway. The relative transcript levels of (a) Wnt5b, (b) Wnt2b, (c) Wnt5a, (d) Wnt11 and (e) Wnt6 in Ctr and Mo testes. (f) Western blot analysis showing a decrease in p-JNK in Mo group, and no change in total JNK levels. (g) Representative images of β-catenin (green) immunostaining in Ctr and Mo testes. ***P < 0.001, Student's t-test, n = 3. Scale bar = 20 μm. Ctr: negative control; Mo: morpholino treatment; Wnt-5b: wingless-type MMTV integration site family member 5B; Wnt-2b: wingless-type MMTV integration site family member 2B; Wnt-5a: wingless-type MMTV integration site family member 5A; Wnt-11: wingless-type MMTV integration site family member 11; Wnt-6: wingless-type MMTV integration site family member 6; p-JNK: phosphorylated form of Jun N-terminal kinase; DAPI: 4',6-diamidino-2-phenylindole; MMTV: murine mammary tumor virus. We observed a decrease in proliferation signals in the Mo group compared with the Ctr group [Figure 6]a and [Figure 6]b. The SSC colony size in the Mo group appeared smaller than the Ctr group [Figure 6]a, [Figure 6]b, [Figure 6]c, [Figure 6]d. The apoptotic signals, labeled in the TUNEL assay, were the same in both Mo and Ctr groups [Figure 6]c. The canonical Wnt pathway, β-catenin, remained the same in both Mo and Ctr groups [Figure 6]d. However, we observed an apparent decrease in Wnt5b mRNA in the Mo group compared with the Ctr group [Figure 6]e. Altogether, the decreased cell proliferation and Wnt5b expression found in SBNO1-deficient SSCs [Figure 6]a, [Figure 6]b and [Figure 6]e were highly consistent with findings from SBNO1-deficient testes [Figure 3]a, [Figure 3]c and [Figure 5]a. Figure 6: Influence of SBNO1 knockdown in SSC culture. (a) Representative images of Ki-67 (proliferative cell marker, red) and PLZF (undifferentiated spermatogonia marker, green) immunostaining in Ctr and Mo SSCs. (b) Representative images of PH3 (proliferative cell marker, red) and PLZF (green) immunostaining in Ctr and Mo SSCs. (c) Representative images showing results of the TUNEL assay (red) in Ctr and Mo SSCs. (d) Representative images of β-catenin (green) and PLZF (red) immunostaining in Ctr and Mo SSCs. (e) Wnt5b mRNA levels in Ctr and Mo SSCs. **P < 0.01, Student's t-test, n = 3. Scale bars = 20 μm. Ctr: negative control; Mo: morpholino-treatment; SBNO1: Strawberry Notch 1; SSCs: spermatogonial stem cells; KI67: marker of proliferation Ki-67; PH3: phospho-histone H3; TUNEL: terminal deoxyribonucleotidyl transferase (TDT)-mediated dUTP-digoxigenin nick-end labeling; PLZF: promyelocytic leukemia zinc finger; DAPI: 4',6-diamidino-2-phenylindole; Wnt-5b: wingless-type MMTV integration site family member 5B; MMTV: murine mammary tumor virus. In our previous proteomic analysis, we identified SBNO1 and found that it potentially plays a role during mouse testes development. Here, we used cultured neonatal mouse testes and SSCs to explore the function of SBNO1 in neonatal testes. Since Sato et al. first obtained functional spermatozoa in cultured neonatal mouse testes, this method has been widely used as a conventional platform for the mechanistic understanding of spermatogenesis.,, For example, by neonatal mouse testicular culture, Zheng et al.found that undifferentiated spermatogonia accumulated in Wilms tumor 1 (Wt1)-deficient testes, which was consistent with the in vivo findings. In addition, using adult mouse testicular culture, Chen et al.showed that treatment with smoothened agonist (SAG), a chlorobenzothiophene-containing hedgehog pathway agonist, partially rescued the decreased testosterone production and steroidogenic gene expressions in Wt1-deficient testes. These results are also consistent with in vivo study. Moreover, in our previous study, we showed that stromal interaction molecule 1 (STIM1) is required for testicular cord formation via gonad culture. Besides testicular culture, cultured SSCs are a proven stable platform for exploring SSC development.,, For example, in our previous work, we established a steady SSC culture method and fertile progeny were produced after transplantation of cultured SSCs into infertile mouse testis. In the present study, we found SBNO1 was predominantly located in the SSCs by co-immunostaining with undifferentiated spermatogonia marker, PLZF. Knockdown of SBNO1 by morpholino in neonatal testicular culture and SSCs culture resulted in reduced SSC proliferation. Previous studies have shown that SBNO1 regulates and activates the Wnt signaling pathway. Therefore, we selected genes of the Wnt pathway, including canonical Wnt/β-catenin and noncanonical Wnt pathway, for further investigations. We selected Wnt2b and Wnt6, which are associated with classical β-catenin Wnt signaling,, and Wnt11, which is often associated with noncanonical β-catenin-independent signaling. We also selected Wnt5b and Wnt5a, which are most often associated with noncanonical Wnt signaling, but also activate classical β-catenin signaling., JNK is a member of the mitogen-activated protein kinases (MAPK) and is involved in the noncanonical Wnt pathway. Our results indicate that the reduction of SSC proliferation in cultured neonatal testes and SSC might be a direct result of SBNO1 inhibition, suggesting that SBNO1 regulates neonatal testes and SSC development by influencing spermatogonia via the noncanonical Wnt pathway. The canonical pathway is referred to as the Wnt/β-catenin pathway. The key effector of this pathway is β-catenin, which is normally found in the cytoplasm of cells. On activation of the canonical Wnt pathway, β-catenin translocates to the nucleus to activate Wnt-regulated transcription of targeted genes. In the testes, Wnt2b is associated with classical β-catenin Wnt signaling and has no defined role in spermatogenesis. However, Wnt2b/β-catenin signaling has been implicated in kidney morphogenesis regulation in conjunction with Wnt11., Takase et al. reported that Wnt6, secreted by Sertoli cells, could stimulate canonical Wnt/β-catenin signaling in undifferentiated spermatogonia, including SSCs. They demonstrated that paracrine Wnt signaling is a key regulator of the proliferation of undifferentiated spermatogonia. In our research, using RT-PCR, we found no visible changes in transcripts of Wnt2b and Wnt6 between the Mo and Ctr groups in cultured neonatal testes, indicating that the canonical Wnt pathway might not be required for the function of SBNO1 in the testes. Furthermore, in this study, we found that SBNO1 was predominately located in SSCs and SBNO1-deficient SSCs showed similar phenotypes to SBNO1-deficient testes (e.g., down-regulated Wnt5b level in SBNO1-deficient group), which implies that SBNO1 might promote proliferation of SSCs by autocrine Wnt signaling. In contrast to the canonical β-catenin pathway, the mechanisms of noncanonical Wnt signaling, independent of β-catenin, have not been well clarified. Wnt5a and Wnt5b are often recognized as mediators of β-catenin-independent signal transduction. For example, Yeh et al. found Sertoli cells expressed Wnt5a in mouse testes, which promoted SSC maintenance by inhibiting apoptosis through JNK signaling activation via the β-catenin-independent pathway. Meanwhile, Zhang et al. showed Wnt5b promoted migration and invasion through activation of the JNK signaling pathway in COLO 205 cells. In our study, we found an obvious decrease in Wnt5b mRNA in the Mo group compared with the Ctr group, whereas, Wnt5a and Wnt11 mRNA levels remained unchanged between the two groups. Moreover, our western blot analysis showed that p-JNKlevels were noticeably decreased in SBNO1-deficient neonatal testes. We revealed similar phenotypes in cultured neonatal testes and SSCs, observing a decrease in SSC proliferation with inactivation of the noncanonical β-catenin-independent Wnt pathway. 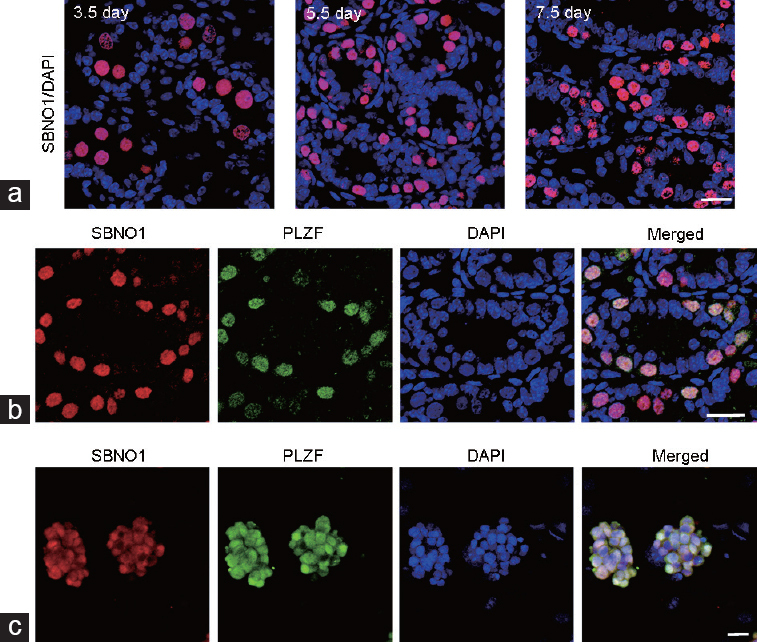 From the above findings, we conclude that the noncanonical Wnt/JNK pathway is one of the crucial targets of SBNO1 in spermatogonia and that it plays an important role in neonatal testicular and SSC development in mice. Here, we investigated the distribution and function of SBNO1 in mammalian testes, using cultured neonatal testes and SSCs. Our results demonstrate that SBNO1 regulates SSC proliferation via the noncanonical Wnt5b/JNK signaling pathway, which provides novel insight into the role of Wnt signaling in SSC development. BZ, HL and XYH designed the study. CS, JY, XZ, CCL, YSG, JWZ, KZ, YY, TTG and SMY performed the experiments. CS and JY analyzed the data. BZ and XYH wrote the article. All authors read and approved the final manuscript. This work was supported by the Suzhou Key Medical Center (grant number SZZX201505), the Jiangsu Provincial Medical Innovation Team (grant number CXTDB2017013), the Suzhou Introduced Project of Clinical Medical Expert Team (grant number SZYJTD201708), the National Natural Science Foundation of China (grant number 31701298), the Natural Science Foundation of Jiangsu Province (grant number 20170562), the Key Research Fund for Zhenjiang Social Development (grant number SH2016028), the Key Research Fund for Zhenjiang Health Science and Technology (grant number SHW2016001), the Open Fund of State Key Laboratory of Reproductive Medicine of Nanjing Medical University (grant numbers SKLRM-KA201603, SKLRM-KA201704). Kanatsu-Shinohara M, Inoue K, Miki H, Ogonuki N, Takehashi M, et al. Clonal origin of germ cell colonies after spermatogonial transplantation in mice. Biol Reprod 2006; 75: 68–74. Kanatsu-Shinohara M, Kato-Itoh M, Ikawa M, Takehashi M, Sanbo M, et al. Homologous recombination in rat germline stem cells. Biol Reprod 2011; 85: 208–17. Takase HM, Nusse R. Paracrine Wnt/beta-catenin signaling mediates proliferation of undifferentiated spermatogonia in the adult mouse testis. Proc Natl Acad Sci U S A 2016; 113: E1489–97. Oatley JM, Brinster RL. The germline stem cell niche unit in mammalian testes. Physiol Rev 2012; 92: 577–95. Lee HY, Kleber M, Hari L, Brault V, Suter U, et al. Instructive role of Wnt/beta-catenin in sensory fate specification in neural crest stem cells. Science 2004; 303: 1020–3. Muroyama Y, Kondoh H, Takada S. Wnt proteins promote neuronal differentiation in neural stem cell culture. Biochem Biophys Res Commun 2004; 313: 915–21. Miller C, Sassoon DA. Wnt-7a maintains appropriate uterine patterning during the development of the mouse female reproductive tract. Development 1998; 125: 3201–11. Arango NA, Szotek PP, Manganaro TF, Oliva E, Donahoe PK. 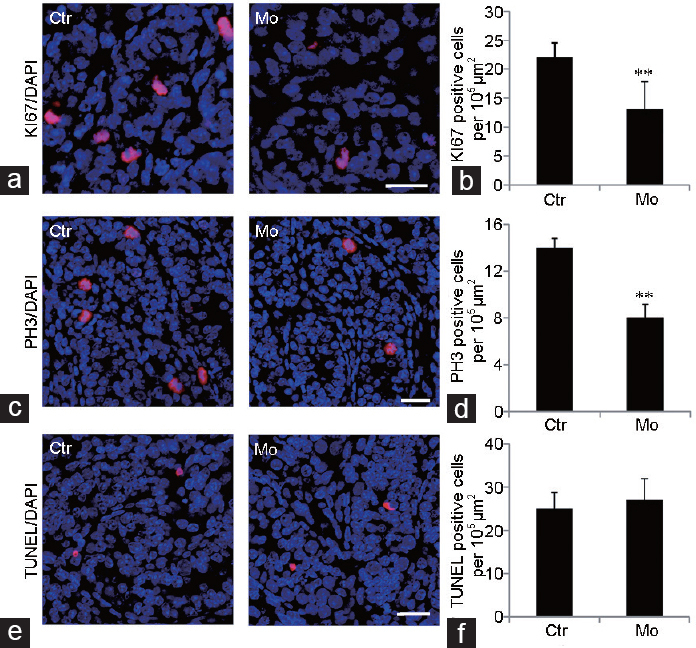 Conditional deletion of beta-catenin in the mesenchyme of the developing mouse uterus results in a switch to adipogenesis in the myometrium. Dev Biol 2005; 288: 276–83. Yeh JR, Zhang X, Nagano MC. Wnt5a is a cell-extrinsic factor that supports self-renewal of mouse spermatogonial stem cells. J Cell Sci 2011; 124: 2357–66. Golestaneh N, Beauchamp E, Fallen S, Kokkinaki M, Uren A, et al. Wnt signaling promotes proliferation and stemness regulation of spermatogonial stem/progenitor cells. Reproduction 2009; 138: 151–62. Watanabe Y, Miyasaka KY, Kubo A, Kida YS, Nakagawa O, et al. Notch and Hippo signaling converge on Strawberry Notch 1 (Sbno1) to synergistically activate Cdx2 during specification of the trophectoderm. Sci Rep 2017; 7: 46135. Takano A, Zochi R, Hibi M, Terashima T, Katsuyama Y. Expression of strawberry notch family genes during zebrafish embryogenesis. Dev Dyn 2010; 239: 1789–96. Takano A, Zochi R, Hibi M, Terashima T, Katsuyama Y. Function of strawberry notch family genes in the zebrafish brain development. Kobe J Med Sci 2011; 56: E220–30. Tsuda L, Nagaraj R, Zipursky SL, Banerjee U. An EGFR/Ebi/Sno pathway promotes delta expression by inactivating Su(H)/SMRTER repression during inductive notch signaling. Cell 2002; 110: 625–37. Nagel AC, Wech I, Preiss A. Scalloped and strawberry notch are target genes of Notch signaling in the context of wing margin formation in Drosophila. Mech Dev 2001; 109: 241–51. Zheng B, Zhou Q, Guo Y, Shao B, Zhou T, et al. Establishment of a proteomic profile associated with gonocyte and spermatogonial stem cell maturation and differentiation in neonatal mice. Proteomics 2014; 14: 274–85. Kang Y, Zheng B, Shen B, Chen Y, Wang L, et al. CRISPR/Cas9-mediated Dax1 knockout in the monkey recapitulates human AHC-HH. Hum Mol Genet 2015; 24: 7255–64. Sato T, Katagiri K, Gohbara A, Inoue K, Ogonuki N, et al.In vitro production of functional sperm in cultured neonatal mouse testes. Nature 2011; 471: 504–7. Zhou Q, Guo Y, Zheng B, Shao B, Jiang M, et al. Establishment of a proteome profile and identification of molecular markers for mouse spermatogonial stem cells. J Cell Mol Med 2015; 19: 521–34. Kuramochi-Miyagawa S, Watanabe T, Gotoh K, Takamatsu K, Chuma S, et al. MVH in piRNA processing and gene silencing of retrotransposons. Genes Dev 2010; 24: 887–92. Chakraborty P, Buaas FW, Sharma M, Snyder E, de Rooij DG, et al. LIN28A marks the spermatogonial progenitor population and regulates its cyclic expansion. Stem Cells 2014; 32: 860–73. Zheng B, Zhao D, Zhang P, Shen C, Guo Y, et al. Quantitative proteomics reveals the essential roles of stromal interaction molecule 1 (STIM1) in the testicular cord formation in mouse testis. Mol Cell Proteomics 2015; 14: 2682–91. Zheng QS, Wang XN, Wen Q, Zhang Y, Chen SR, et al. 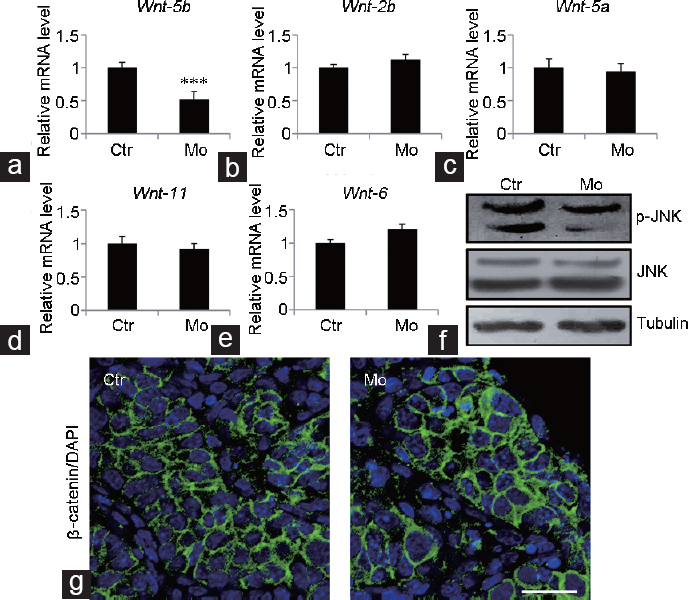 Wt1 deficiency causes undifferentiated spermatogonia accumulation and meiotic progression disruption in neonatal mice. Reproduction 2014; 147: 45–52. Chen M, Wang X, Wang Y, Zhang L, Xu B, et al. Wt1 is involved in leydig cell steroid hormone biosynthesis by regulating paracrine factor expression in mice. Biol Reprod 2014; 90: 71. Kanatsu-Shinohara M, Tanaka T, Ogonuki N, Ogura A, Morimoto H, et al. Myc/Mycn-mediated glycolysis enhances mouse spermatogonial stem cell self-renewal. Genes Dev 2016; 30: 2637–48. Yeh JR, Zhang X, Nagano MC. Indirect effects of Wnt3a/beta-catenin signalling support mouse spermatogonial stem cells in vitro. PLoS One 2012; 7: e40002. Wang SH, Chang JS, Hsiao JR, Yen YC, Jiang SS, et al. Tumour cell-derived WNT5B modulates in vitro lymphangiogenesis via induction of partial endothelial-mesenchymal transition of lymphatic endothelial cells. Oncogene 2017; 36: 1503–15. van Amerongen R, Mikels A, Nusse R. Alternative Wnt signaling is initiated by distinct receptors. Sci Signal 2008; 1: re9. Veeman MT, Axelrod JD, Moon RT. A second canon. Functions and mechanisms of beta-catenin-independent Wnt signaling. Dev Cell 2003; 5: 367–77. Clevers H. Wnt/beta-catenin signaling in development and disease. Cell 2006; 127: 469–80. Lin Y, Liu A, Zhang S, Ruusunen T, Kreidberg JA, et al. Induction of ureter branching as a response to Wnt-2b signaling during early kidney organogenesis. Dev Dyn 2001; 222: 26–39. Zhang Y, Lin L, Jin Y, Lin Y, Cao Y, et al. Overexpression of WNT5B promotes COLO 205 cell migration and invasion through the JNK signaling pathway. Oncol Rep 2016; 36: 23–30.